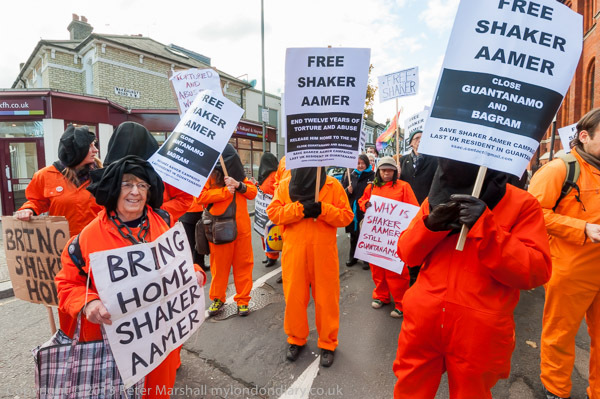 The Free Shaker Aamer march in Battersea wasn’t a particularly easy event to photograph, and I had to work hard to get decent pictures. 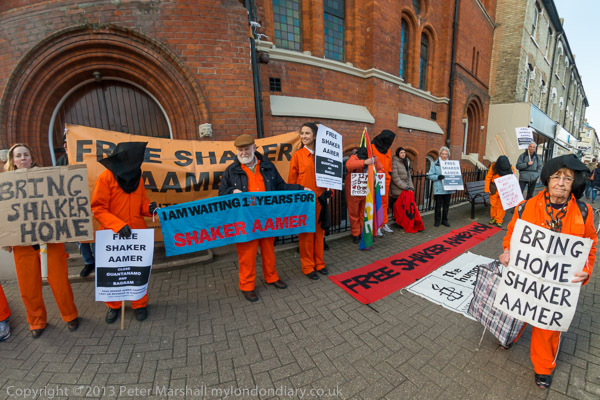 There were around thirty people taking part, many of them dressed up in the orange Guantanamo-style jumpsuits, some with black hoods covering their faces. The black hoods can be dramatic, but they are very much a cliché, and I do like to see people’s faces in my pictures. Fortunately as you can see here some people wore hoods and others didn’t. 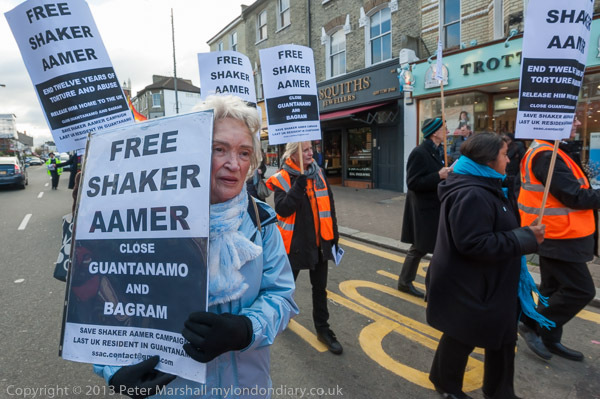 Battersea is where Shaker Aamer’s family lives, and hopefully where he will come back to when he is eventually released from Guantanamo, though the US and British authorities would like to send him back to the country of his birth, where he would be locked away and unable to testify about his torture since he was captured 12 years ago in Afghanistan. His evidence will certainly embarrass both US and UK intelligence agencies. Probably most people know this part of Battersea better as Clapham Junction, one of the world’s busiest and best-known railway stations. Clapham was a more up-market place when the station was built (and probably the influential folk of Clapham didn’t want a nasty smelly railway through their backyards) so although the station was built among the slums of Battersea, the railway company opted for a more prestigious name. It was after all only a short ride in your horse and carriage from Clapham, though now the 37 bus probably takes a little longer through London traffic. When I first went there, Northcote Road, a quarter-mile south of the station, was a fairly typical inner London street market, lots of fruit and veg, cheap clothing and the rest. Good transport connections have meant it has come up rapidly in the past twenty or thirty years and it’s now extremely gentrified, with stalls selling a dozen varieties of olives and olive oil, artisanal bread and the rest, most of the old pubs now replaced by rather trendier establishments. The protesters were handing out leaflets on the street, just south of the street stalls, where the pavement widens out slightly in front of a Baptist church but is still rather constricted by some bicycle parking stands, and the march was to start from the corner there. It wasn’t easy to take an overview showing all the banners and a reasonable number of protesters, partly because half of them were standing behind me on the roadside edge of the pavement and the rest – in picture – up close to the church so that people could still walk along the pavement. And there were enough people walking along it to mean I spent a lot of time waiting for a clear view. I could only stand rather close, partly to avoid the clutter of the bike stands, but also because if I moved further back I would have had the other half of the protesters in the way too, not to mention having to spend most of my time jumping out of the way of traffic on the fairly busy road. This was another occasion where the extreme wide angle of view of the 10.5mm full-area fisheye proved its worth. 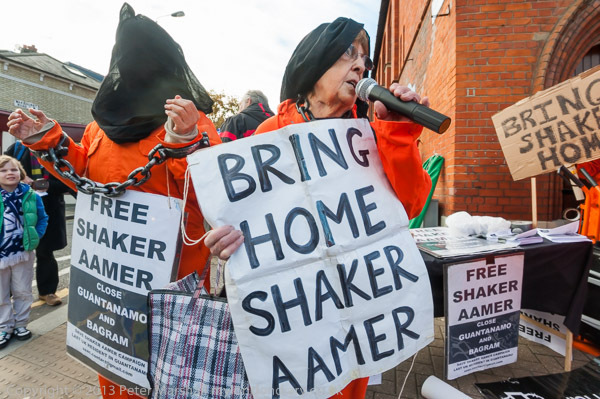 This particular frame – corrected as usual with Fisheye-Hemi – stood out from the rest because of the figure holding the ‘Bring Home Shaker Aamer‘ poster at the extreme right. 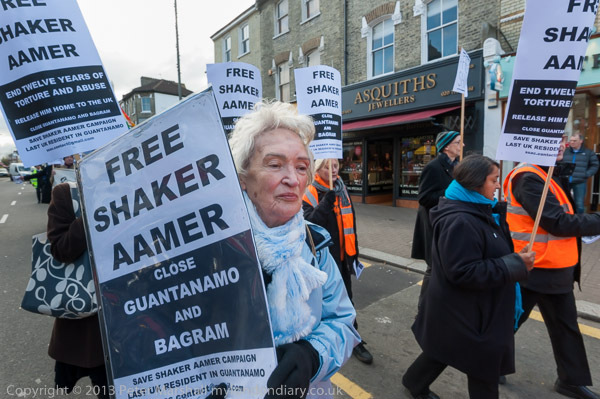 The woman is Joy Hurcombe, the Chair of the Save Shaker Aamer Campaign, and she has her hood pulled back from her face to better see where she is going as she walks towards me. She had been standing at the far end of the row, next to the man just to the left of her head, and rather small in the pictures, but I saw the possibility as she walked towards me and quickly took a couple of pictures. As well as adding a little dynamism to the image – and the slight angle she is at adds to the impression of movement- I like having a similar figure at both edges. I would have liked another couple of inches at the left to show the edge of the poster held there. Were I to develop this image again I would add a little brightness and contrast to that sign on brown corrugated card. I usually try to keep the fisheye level when taking pictures, which avoids the splaying out of the verticals. But this was a picture I had to take very quickly, and I think it actually helps here. I’d chosen to work from this side of the scene because of the group of three people around the blue banner which makes a nice contrast to the orange suits. I seldom like to work from the centre with groups as I find it makes for less interesting pictures. Joy was walking across in front of me when I made the first picture, to take the microphone and speak at the street corner, and I followed her to photograph her speaking. There was a woman a metre or so to her left as she spoke dressed in an orange jumpsuit and black hood, and I moved close to her, filling the left of the frame, with Joy speaking in the centre. It wasn’t bad, but in the background between the two figures there were a couple of people talking who were rather a distraction. I don’t like to set up pictures or direct events, but after trying 14 frames and not getting an image I felt was quite strong enough I asked the woman to move closer to Joy, then moved across in front of the two of them and knelt down, partly to more or less hide the figures behind these two. I moved in close and went down on my knees and edged a little closer – I was using the 16-35mm on the D700 at 16mm – and tried to fill the frame as much as possible with the two women and the posters they were holding and in the background. There were two figures at the left – a child and father that I was watching too, and wasn’t sure how to cope with; I took a series of 8 frames watching them and the speaker’s face, which much of the time was turned a little too much away from me. But in this frame she turned towards me and the man was behind the other woman’s arm, with the boy looking towards the speaker. This is a picture I don’t think I would have got on film, firstly because I would not have been so sure that the previous 14 frames weren’t quite what I wanted, and second because I would not have gone on working for 22 frames – and quite likely would have had to stop and change films with only 36 exposures to play with if I had tried. After a couple of short speeches the march formed up to make its way to a longer rally inside Battersea Arts Centre, which I didn’t go to as I was due at another event. I photographed the two large banners at the front and those holding them, then walked behind them inside the main body of the march, again working with the 16-35mm. There I took another picture with Joy in it, almost the only face visible, though there are ten orange jumpsuits visible in a nicely chaotic grouping. I was feeling that my pictures so far were far too orange. It’s a striking colour, though one that digital sensors have something of a problem with, particularly with bright fluorescent dyes, tending to lose highlight detail. But not everyone was wearing orange, and the posters were black and white. Several of the marchers attracted my attention and I tried to make pictures with them as the main figure, moving in close with the 16-35mm lens, using it at the wider end. Walking backwards and just to one side of her, I took three frames of this woman holding a poster. The second of the three was unusable because she had closed her eyes. The upper one which was the first frame, with the lens at 19mm was in some ways ways the better picture, with a more dynamic tilt to the poster a slightly closer viewpoint and less of those distracting yellow lines, but in the end I chose to use the lower one (made three seconds later – I’d zoomed out very slightly to 18mm and we’d walked a few yards down the road), mainly because her eyes are wider open and I prefer her expression, but also I like having both of her black gloves. It isn’t just the pale blue of her jacket, although it was a change from all that orange, but I think there is a determination in her stance and expression that attracted me. It seemed very much a picture of protest. This entry was posted on Tuesday, December 17th, 2013 at 10:17 am and is filed under My Own Work, Photo Issues, Political Issues. You can follow any responses to this entry through the RSS 2.0 feed. You can leave a response, or trackback from your own site.